Director Nicholas Hytner, who made his Met debut with this production, brings out all the passionate intensity that is at the heart of Verdi’s monumental drama. 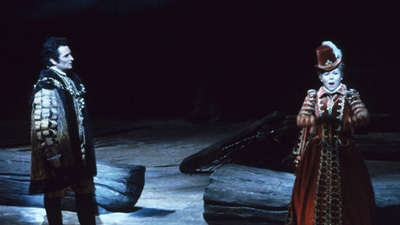 Don Carlo (Roberto Alagna), the Spanish crown prince, and Elizabeth of Valois (Marina Poplavskaya), daughter of the King of France, fall in love, only to be torn apart by international politics when Carlo’s father, King Philip II (Ferruccio Furlanetto), decides to marry Elizabeth himself. Carlo’s friend, Rodrigo (Simon Keenlyside), plays a dangerous game, balancing his political aims with the trust of his monarch. And when the beautiful Princess Eboli (Anna Smirnova) discovers her love for Don Carlo is not returned, her revenge terribly backfires. Yannick Nézet-Séguin conducts the Met orchestra and chorus.